It should come as no surprise to readers of this site that people who buy electric cars are normal people. A new study by Simon Fraser University in British Columbia adds to the body of evidence demonstrating that, though it comes to some unusual conclusions. The 2017 study examined 2,123 Canadians who planned to buy a new vehicle in the next year, and asked them to choose a vehicle and then a powertrain—conventional gasoline, hybrid, plug-in hybrid, battery electric, or fuel cell—at given price points, for the car they already wanted to buy. Study authors then normalized the data to correspond with Canadian national demographics. The study also grouped respondents according to their worldview to help determine whether buyers willing to pay more for hybrids or electric cars were motivated by different factors. Finally, the study looked at cash incentives and public investment in infrastructure to see what it would take to tip the scales significantly toward one type of cleaner vehicle or another. In the first question, buyers were asked to choose the make and model of car they wanted. 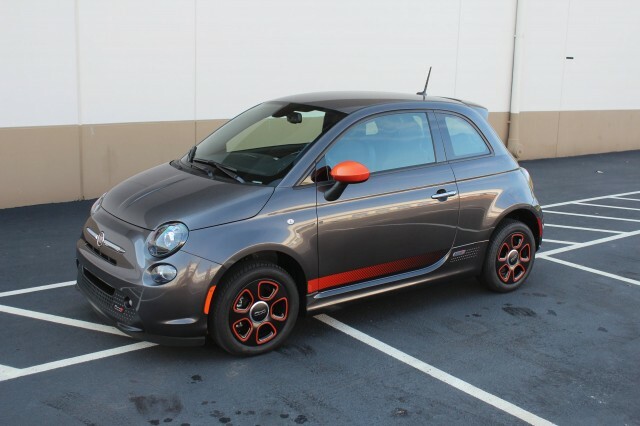 Once they did, they were presented with the five powertrain options.Those who chose battery electric or plug-in hybrid options were then asked to choose the battery size they preferred, based on its attendant cost. 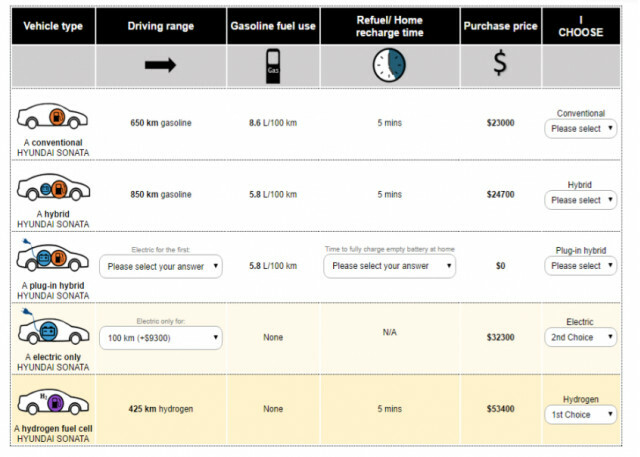 Those who chose plug-in hybrids could choose a battery with 20, 50, 80, or 110 kilometers of range, in both the high- and low-cost scenarios. Battery-electric car buyers could choose to buy a car with 100, 140, 220 or 300 km of range in both high- and low-cost scenarios. The purpose was to see if higher battery costs caused people to choose shorter-range cars. In the first section of the survey 45 percent of Canadians chose a conventional gas vehicle, even with low-cost batteries. In that scenario, another 33 percent chose traditional hybrids. Only 12 percent chose plug-in hybrid vehicles. That left only single-digit percentages, 5 percent and 4 percent, choosing battery electric or fuel-cell vehicles. Even that is orders of magnitude more electric or fuel-cell cars cars than are sold now. The researchers also wanted to know what personality factors caused people to choose low- or no-carbon vehicles, and whether different personality traits caused them to choose different vehicles. The motivational factors they considered were traditional values (such as might be expected to lead a person to buy a conventional gasoline vehicle), altruistic values, an environmentally oriented lifestyle,actual environmental concern, or a technologically oriented lifestyle. Perhaps predictably, conventional vehicles scored well with all types of buyers and did especially well with buyers who held traditional values. 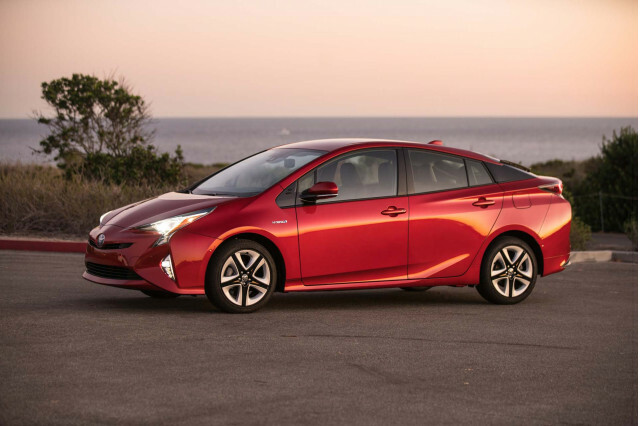 Conventional hybrids such as the Toyota Prius scored especially well with technologically oriented buyers. 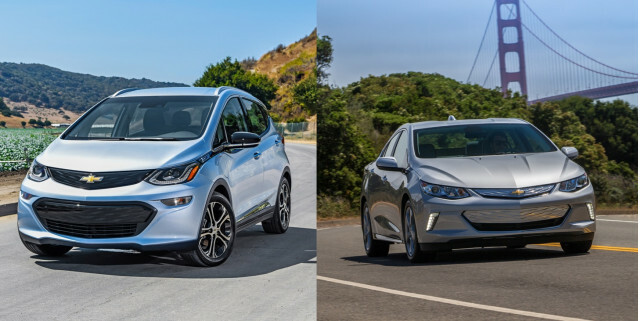 Both of those groups gravitated toward plug-in hybrids, along with altruistic buyers. Battery electric cars scored big with Altruistic buyers, those concerned about the environment, and those with an environmentally oriented lifestyle. Although few buyers chose fuel cell vehicles, those who did were about evenly split between altruists and those who held traditional values. 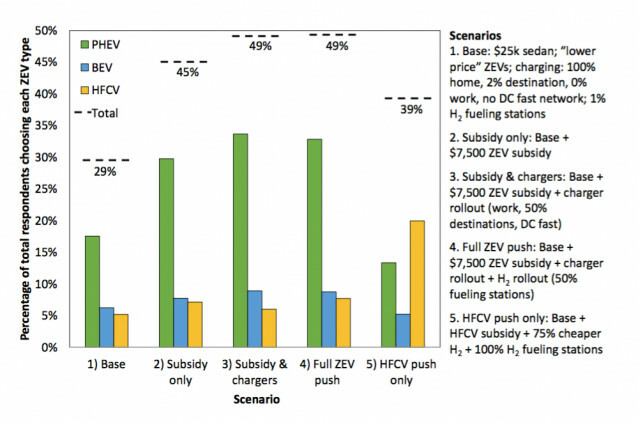 In the final part of the study, researchers found that no matter what subsidies were pushed, from no cost offset and very little public charging infrastructure to a $7,500 rebate plus widespread Level 2 and Level 3 public fast charging and hydrogen fueling stations had much effect on adoption of battery electric cars or fuel cell vehicles. What motivates green car buyers Source: Axsen, Kormos, Long and Goldberg. A $7,500 purchase subsidy served to increase interest in plug-in hybrids, which increased even more with additional public charging infrastructure. Interestingly, dispensing with electric-vehicle incentives and focusing entirely on rolling hydrogen refueling out to every public gas station had a dramatic effect on the adoption of fuel cell vehicles at the expense of plug-ins of any kind. CHECK OUT: Toyota's fuel cell fervor: foolishness or foresight? It's hard to know whether conclusions from a Canadian study such as this apply more widely to other countries such as the United States. First, cheaper batteries alone won't get consumers to abandon their internal combustion cars for any type of electric car. Which EVs Canadians will buy with the right incentives Source: Axsen, Kormos, Long and Goldberg. Second, continuing $7,500 purchase incentives for plug-in cars can have a dramatic effect in increasing the adoption of plug-in hybrids, especially in conjunction with increased public charging (although it's not clear whether those buyers will plug their cars in consistently.) Such incentives, however, have little effect on the adoption of pure electric cars. 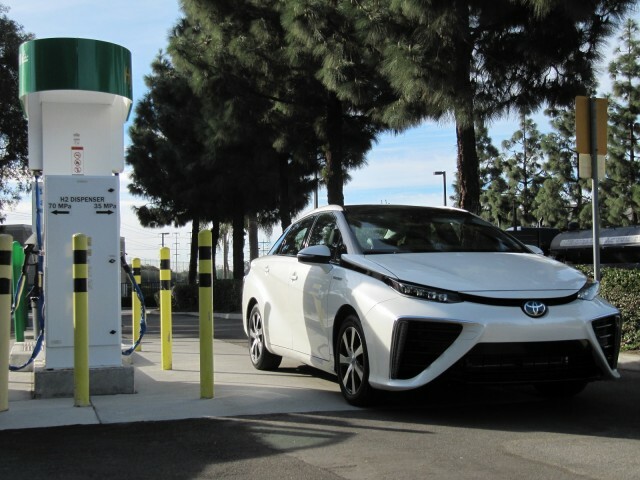 Third, if hydrogen fueling infrastructure could be spread as widely as gasoline refueling, fuel cells seem to capture the imagination of the buying public in a way that electric cars don't.